Being a local to Chicago makes me one of the luckiest people when it comes to a staycation. Instead of airfare, I pay a round-trip price of $16 to get to and from the city and can plan a trip around hotel prices. Plus, the location can’t be beat. Even New Yorkers get out of their city when they take a staycation. I mean, that’s why the Hamptons exist, right? When I’m desperate to get away but don’t have the time or bandwidth to plan an actual trip, I’ll open Hotel Tonight or check a few of my favorite hotels in the city to see where I can find the best price. Next thing you know, I’m embarking on a long weekend away. It’s also nifty if I have a busy few days and need to be closer to everything. For example, I’ll be staying in the city a few days this week for two jam packed mornings of work commitments. The hotel of choice for this particular early summer staycation (although you would have thought it was August with the scorching temperatures we had) was An Iconic Hotel by Staypineapple. I love the Staypineapple brand because they have a talent for taking old buildings and bringing them back to their original personality. Located in a National Historic Landmark, An Iconic Hotel (previously The Alise) was built by famous architects Daniel Burnham, John Root, and Charles Atwood. If those names sound familiar, they should. Daniel Burnham and John Root were responsible for a good portion of Chicago’s iconic architecture and Burnham was the lead mastermind behind the Chicago World’s Fair of 1892. Burnham’s story of creating the monumental event recently gained popularity thanks to Devil in the White City by Erik Larkson which simultaneously tells the story of H.H. Holmes, the first documented American serial killer. As irony would have it, he also built an iconic building. Except, his building was more of a hotel of horrors for the women he preyed on during the World’s Fair. The book is overall really good with a fantastic insight into the history of Chicago. Specifically the architectural geniuses behind the skyline. Leonardo DiCaprio bought the rights to the novel years ago and was supposedly turning it into a film with Martin Scorcese. However, while fact-checking for this article, I happened to find out it’s instead being turned into a series on Hulu! Please excuse me as I fangirl scream for a hot second. Originally it was thought that DiCaprio would play Holmes but it seems that he might only be behind the scenes on this one. Regardless, this is bound to be an award-winning project. These two create incredible films together. Checking in to An Iconic Hotel is easy and seamless. The front desk is very friendly and there’s always chilled water infused with fruit it for a quick drink in or out. Let me tell you, when temperatures are hitting 100 degrees, that water is a welcome sight. The entrance to the hotel is shared with the entrance to their restaurant, Atwood Cafe. You take your bags towards the elevator before going up to your room and are greeted with a gorgeous staircase and tiled floor that came out of a completely different time. What I love about the old historic buildings in Chicago is the intricacy and detail. Architecture and design was a pure art form and no detail was left unnoticed. It’s rare to find a new build with as much precision and artistry as these older buildings have. It’s as close as you’ll get to stepping into the past and that runs through the veins of this hotel. From the elevator to each of the floors, you can feel the appreciation for the building’s history right down to the classic lock and key that lead you into your suite. I stayed in a Deluxe King room facing State Street with a sliver view of the Lake and Millennium Park. It was spacious with a desk for working and large entertainment center. The windows practically took up the entire far wall and the bathroom was clean with a nice amount of counter space. Every room comes with complimentary internet service and a streaming service unique to Staypineapple which is, I’ll admit, probably very convenient for most people but too complicated for me. Tech savvy is not a way I’d describe myself. The rooms come with complimentary, unlimited bottled water, coffee and tea. There is a large variety of snacks including a large package in the shape of a pineapple available for purchase. The slippers are complementary to take home and the bathrobes are incredibly comfortable and also available for purchase! 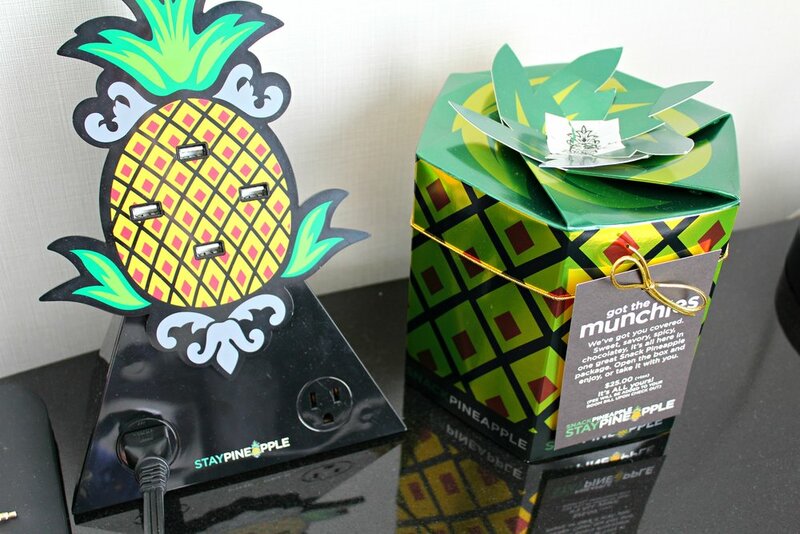 Another unique quality of Staypineapple is that they make it as easy as possible to take their experience home with you. Most of what you can find in the room, including the bedding, is available for sale on their website. I happened to adore the Tommy Bahama bath products. I felt like I smelled like the beach all weekend! Room service is available although this was one occasion I did not order any. Atwood Cafe downstairs is a gorgeous space with great views of State and Washington Streets. The design is sophisticated which gives it a luxury feel but the food is far from pretentious. Serving American cuisine, the menu has everything from charcuterie plates to burgers. The restaurant is open for breakfast, lunch, dinner and brunch plus it serves up craft cocktails and tasty desserts. As fate would have it, I have a reservation there for dinner this week! The last morning of my staycation, I went down for an early brunch and indulged in the Atwood Omelet featuring bacon, caramelized onions, brie and breakfast potatoes with plenty of freshly brewed coffee. Nothing says “vacation” to me like eating breakfast and sipping really good coffee that you didn’t have to make or brew yourself. What’s even better is that there are no dishes to clean up! An Iconic Hotel is located in the heart of Chicago’s Loop. Right at the intersection of Washington and State streets, you’re close to Broadway in Chicago, Millennium Park, the Magnificent Mile, Lake Michigan and more. Public transportation at this part of the city is a breeze to access. You have every single ‘L’ line and about a dozen buses including one that takes you right to Navy Pier. There’s lots of shopping along State Street and for more upscale stores, head to Michigan Avenue a few blocks away. There are plenty of places to dine, grab a cup of coffee, or sweets. The Art Institute of Chicago is a short walk away and the museum campus is a quick ride via public transportation. Chicago’s Restaurant Row on Randolph Street is a mere few stops away on the Green line and any other neighborhood you might want to reach is also a quick trip away thanks to this being the transportation hub of the city. Staypineapple is one of the first hotel groups I look to see if I can stay at regardless of the city I’m traveling to. They have great quality properties and each one has a unique personality but the same wonderful experience. An Iconic Hotel﻿ is located in a fantastic location with competitive pricing. Staying in Chicago is not very cheap. Hotel prices can be astronomical but An Iconic Hotel won’t break the bank and if you sign up for their newsletters, you can often score great deals. Another quick tip...booking via mobile will get you an extra discount. That’s how I booked my stay and it saved me even more money.